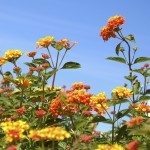 Is Lantana frost hardy or should it be overwintered inside? I have a small greenhouse that could, at a push, house my plants, but would prefer to leave them outside. The garden is fairly protected but I would like to know in plenty of time to prepare the space if needed. If your temperatures fall below freezing, it will likely not winter over outdoors.